Heart's Delight Cards: WELCOME TO THE TOUR! Welcome, and thank you so much for stopping by on the Stampin' Addicts Occasions Mini Catalog Blog Tour! The new catalog is just out, and orders can begin on January 5th, so we wanted to show you some of the fabulous new goodies in the catalog. And BONUS, the new catty coincides with Sale-A-Bration, so you can get free stuff as well! This Stampin' Addicts blog tour runs from 9 a.m. (PST) Friday Jan. 1st until midnight (PST) Sunday Jan. 3rd., so please be sure to tell your stamping buddies to check it out. 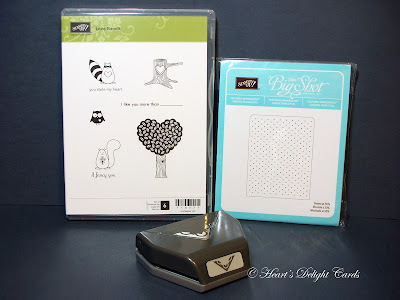 Today I am showcasing the very adorable LOVE BANDITS stamp set, along with the Scallop Trim Corner punch and the Perfect Polka-Dots Textured Impressions embossing folder. 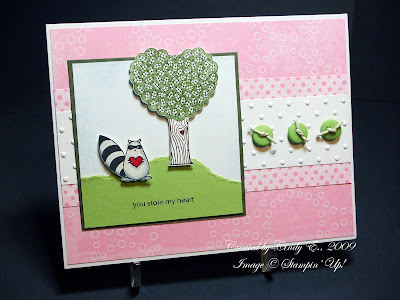 I used the embossing folder on the first card with the little Love Bandit raccoon. Isn't he just too stinkin' cute?! And the heart-shaped tree, too. You could stamp it in pink or red, and just cut out the upper part of the tree for a cute scalloped heart! On the second card pictured above, I used the Scallop Trim Corner punch on the mat behind the squirrel, and to make the lacy looking border, as well. Cool, huh? 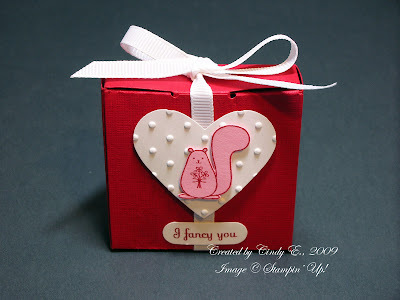 For the third project, I went with a Bitty Box, embossing the dots on the heart (Full Heart punch), and then stamping a pink squirrel. (Hey, isn't that an adult beverage? LOL) This would be so cute filled with M&M's or candy conversation hearts. If you're following the tour in order, you just left Krystal's blog, where she probably knocked your socks off with the adorable Scallop Heart Embosslit. Isn't she amazing? More talent in her pinky finger than I have in my whole self! Next stop on the tour is Kim's blog, where she is going to wow you with the Folk Flower Stencil! So hop on over and see what Kim did with a Tee shirt! WOW - I don't know how I didn't think of it, but I didn't realize you would end up with a little framed square by using the Scallop Trim corner punch!! Your projects are all fabulous - that stamp set is super adorable!! I love the little box! Thanks for sharing your wonderful ideas! I love the way you used the corner punch to make a frame! This set (and your work) is so cute! Great job! LOVE how you used that corner punch! Very cute use of the set! I love the raccoon card. That tree is just adorable! I love all the extra touches you add. So cute! I like the way you used the corner punch. Great use of the punch! Love the raccoon card! Too darn cute! Your projects are absolutely adorable!! I really didn't think I needed this set, but now, wow! Great ideas with the Scallop Corner Punch as well! Adorable projects Cindy!! I love that first card. So cute! And you make me blush with your sweet comments! :) Happy New Year! Beautiful projects! I love this stamp set and you did a fantastic job showcasing it and the punch! So cute, Cindy! Love all of your projects, especially the first card! I don't know if I'm more impressed with your projects or the fact that you are a grandmother as you look so young! Excellent work!!!! Super cute! Love the use of the corner punch. I got this and haven't punched with it yet! The pink squirrel comment made me LOL. Cute projects. I really like the first one with the raccoon and tree. Thanks for sharing. What cute projects! Love the Pink Squirrel box! Oh don't you make me fall in love with that heart bandits set, don't you do it!! lol Loved all your projects, but that first card was the bees knees!! Cute, cute cute! Love the pink squirrel.. that's sweet! 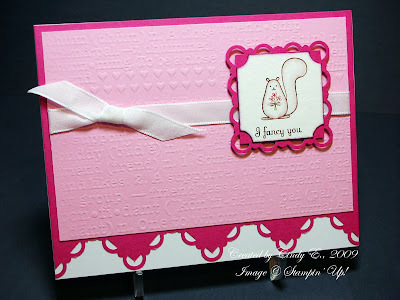 Oh my goodness, look at that punched border on your squirrel card--too cute! You've really brought out the whimsy in this set, Cindy! Cute, cute, cute! Love the tree and the creative border! Those little love bandits are adorable!!! Cindy!! Too stinkin cute projects!!! Love them!! Great job :)Loved how you used the punch too, great idea! Well, thanks a lot! I wasn't planning on buying this set, but now I guess I'll have to! You did a great job of making those little animals look irresistible. I was getting the punch and now I know a new way to use it. Woo-hoo...way to go!